I'm late with this food review. However, it's important to post my thoughts so, when they come around again, you have an idea of how I felt about these. These were out around Valentine's Day. I'd heard about them from members of my World of Warcraft guild. I didn't get out much in February, so trying to find them took a back seat to just existing. Then, I had to go to Target for something and they were on an end cap. I won't eat coconut or mint M&Ms and I've heard a rumor of chili-spiced which is just...no. But something like this, I'll try. 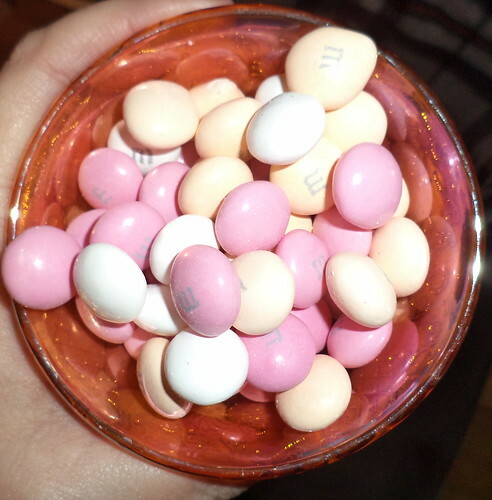 As advertised on the package, they were pink, white and ivory. Taste? Well, they weren't bad. I've railed in this space about how I think M&M's needs to stay with what they do best: peanut, milk, and peanut butter M&M's. I'd allow the crispy ones. Those aren't bad either. The almond ones are blah. I know people who adore the coconut and mint ones so those can be on the shelf, too. But all the different flavors seem to me to be diluting what they do best. At Target right now are red, white and blue M&Ms. I can get behind changing the colors on the brands. That's a clever way to make them relevant to the upcoming holiday, but multiple flavors? 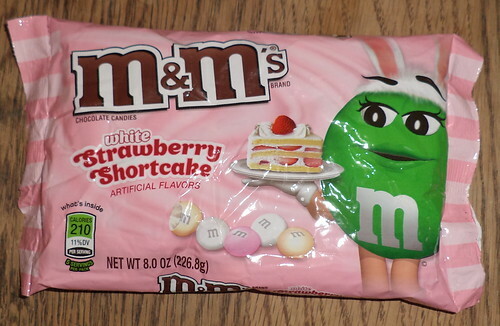 I bought a bag of strawberry shortcake M&Ms. They were not horrible like the candy corn or pumpkin ones were, but they aren't anything I can't live without. There was a hint of strawberry but the overwhelming flavor was artificial white cake. Strawberry shortcake is an amalgam. It shouldn't be mostly about the cake. These were more bland than exciting. So, my recommendation is, if you like M&Ms and want something of a novelty AND they are on sale, buy a bag. Otherwise, save your pennies or support the original flavors. Sometimes I get concerned that they will be so busy trying for new flavors that they will forget to make M&M's with peanuts.